One of the most amazing sites in the world can be found in the Serengeti right in the Eastern parts of Tanzania. This is none other but the Great Serengeti Migration. In fact it has been renowned as one of the amazing Seven Wonders of the World. It is also known as “The world Cup of Wildlife”. According to me, if there is a Safari you should try out, this should be it. This great site is formed by both the Maasai Mara in Kenya and the Serengeti National park in Tanzania whereby the country border splits both National parks down the middle but this divide certainly cannot bound the animals from migrating – the border is just for us humans whilst the wildlife can pass freely. There is nowhere else in the world can this be found. No such immense migration can be found anywhere else in the world. These Wildebeests migrate from the Serengeti in Tanzania to the greener pastures of the Maasai Mara in Kenya during the month of July all through to October. The migration will have to happen by crossing the Mara River of which is full of crocodiles. The crocodiles will prey on the Wildebeest as they try to cross the river. This is one of the best scenes as the Wildebeest try to cross the Mara River and get to Maasai Mara alive. Once in the Maasai Mara the Wildebeest will be hunted and run down by the bigger carnivores. The Maasai Mara has one of the biggest cats in the world. The lion and the great African Leopard. This great site has contributed a lot to the BBC’s Big Cat Diary. The most amazing thing is that this particular migration happens around the exact same time of the year. This natural phenomenon is largely determined by the availability of grazing. This is the period which is just between the month of January and March. This happens right before the calving season commences. 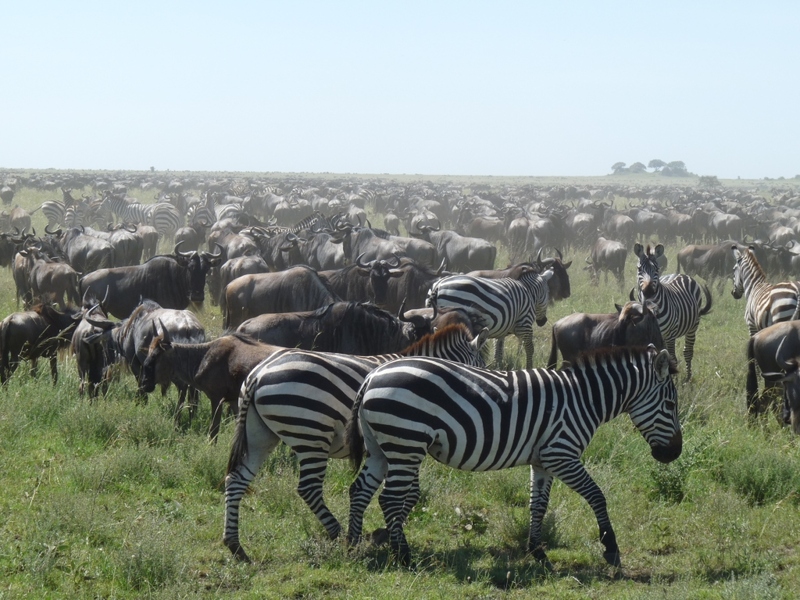 After this period there are almost 2 million of wildebeest and around 1 million zebras which will do the whole crossing. During the time of February, the Wildebeest will give birth to around 500,000 calves in a span of three weeks. This will mostly ensure their survival. If any of the calves are born ahead of time, it is very difficult (almost nearly impossible) to survive to the time of the great migration. This is because the predators will always target the younger calves who are more noticeable compared to the older calves of the previous year. When the rains end in May, the great herd of the wildebeest will move northwest to the areas surrounding the Grumeti River where they will remain until late in the Month of June. The herd will start crossing the Grumeti River and the Mara River in the beginning of July. This is here the whole action takes place for anyone looking for a Great Safari involving the Great Migration. The herds will arrive in Kenya in the late July and August. They will stay here for the remainder of the dry season except some animal like the Thompsons Gazelle and the Grants Gazelles which move only East and West. In the beginning of November, which is also the beginning of the short rains, the migration starts moving South again to the short grass plains of the south east. They will arrive in December which will leave a lot of time for calving in February. It is in this time that over 250,000 Wildebeest die. They will die either of hunger, thirst or predation by the big carnivorous. The Migration from Tanzania to the Maasai Mara National Reserve in southwest Kenya is approximately 800 kilometres. This makes it hard for some animals to cope with this.